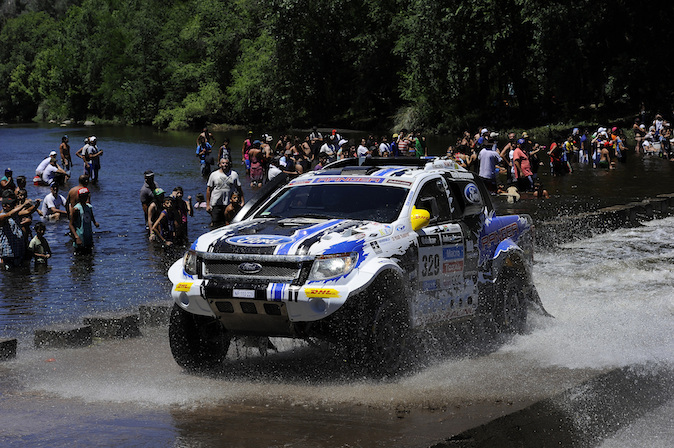 SAN LUIS, ARGENTINA - Team Ford Racing made its highly anticipated competitive debut on the Dakar Rally today. The event lived up to its reputation as one of the world's toughest races with both crews unfortunately picking up mechanical woes. Lucio Alvarez / Ronnie Graue (308) and Chris Visser / Japie Badenhorst (329) set off from Rosario just after 6 am, covering the lengthy 405 km road section before the start of the special stage in the region of Cordoba. The 180 km competitive section was extremely rocky and narrow, throwing the teams into the thick of it right from the start, with searing 36-degree heat adding to the challenge. Unfortunately Alvarez/Graue encountered problems with the Ranger's throttle body on the engine 100 km into the stage. They had to fit a spare unit before they were able to continue. This cost the Argentine pair approximately two hours, but they managed to complete the remaining stage and 224 km liaison to the bivouac in San Luis without further problems. The total stage time of 4 hr 25 min 44 sec saw them finish 2 hr 5 min 8 sec behind stage winners Carlos Sousa and Miguel Ramalho (Haval). Visser/Badenhorst were running as high as ninth at the stage's first waypoint, a mere 43 sec behind the leader. However they were sidelined when the wheel nuts sheared off the front right hub, and they had to wait for the team's T4 race truck to arrive to conduct repairs. They managed to finish the stage, but lost a significant 4 hr 34 min 38 sec to the front-runners. "It has been a tough first day, and we are disappointed. After about 100 km the throttle body broke and we had no option but to stop and change it. "It was a long job but it was worth it, and although we lost a lot of time we were able to finish the stage. We will take tomorrow as a new challenge and fight our way through the field." "It's a disappointing start for Team Ford Racing, but these things happen in motorsport. The Dakar Rally is a very long and tough event, and we would prefer these issues to present themselves at the beginning of the race instead of close to the end. "Lucio and Ronnie worked extremely hard in sweltering heat to get the car going again, which shows their determination not to give up. "The team is working flat-out getting the cars ready for tomorrow. We believe that we have the cars and the crews to be competitive, and trust that both teams will be able to claw back time on the leaders." After another early start, the drivers face a 304 km liaison section before the 433 km special stage. This is the fastest special stage of the rally, at least for its first part, and will also be the one where drivers will have to face the first dunes. It won't just be a brief encounter with sand â€" in the last 100 kilometres, the exploration of the grey dunes of Nihuil will be even more intensive than during previous visits. The sand is more firm there, but the experience will provide a great deal of insight about each of the competitors' technical skills. In short it will be a veritable test. The day ends with a 62 km liaison to the bivouac in San Rafael. For further information, press images and news releases, visit www.FordAtDakar.com. The team's progress and latest updates can also be followed on Facebook (www.facebook.com/FordAtDakar), Twitter (@FordAtDakar) and via #FordAtDakar.